Now available in black or silver finish! - Top quality, super-high riser bar as found on the Inspired Arcade bike. - Extruded from 7050-T6 aluminium. 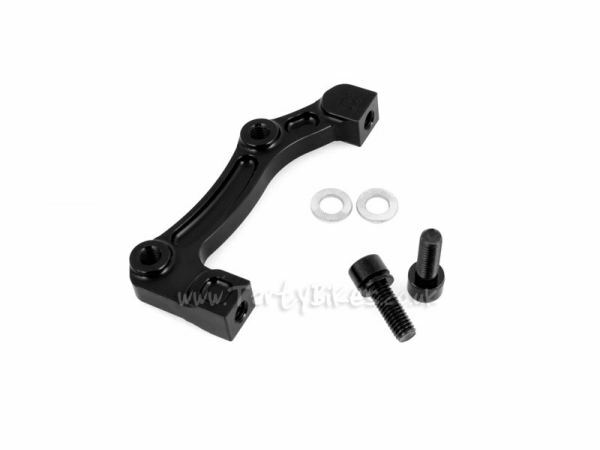 - 31.8mm oversized stem clamp diameter for increased strength. 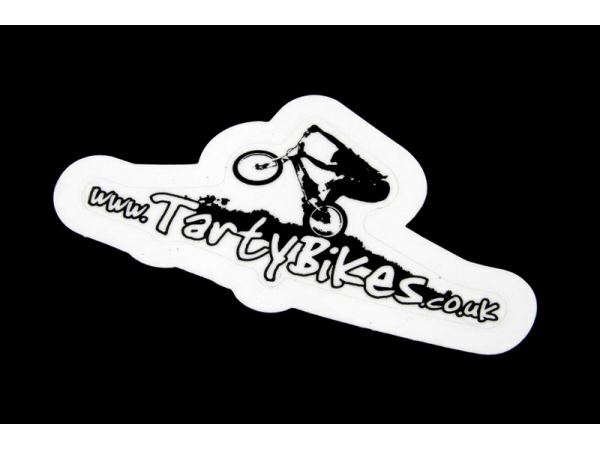 - Available in anodised matte black or silver with high resolution laser etched Inspired graphics. 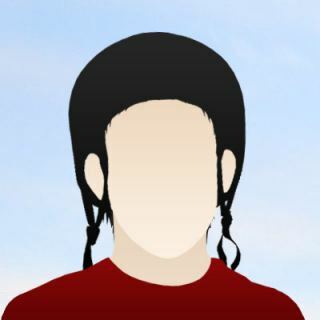 Hi, I have a Flow plus and I'm riding in Kabul, Afghanistan. Is there anyway I could buy an Inpired Arcade Rriser Handlebare and can you ship it Kabul ? Is it possible ? Thanks Best Regards. Shipping parts to Kabul is no problem! The only issue we have is that the Arcade bars are out of stock at the moment, but once they're back in stock you would be able to order them through the website as normal. To be notified when they're back in stock, click the 'Notify Me' button on the product page and enter your e-mail address. As soon as they're put back in stock you'll receive an e-mail from us. Once they're back in, to check shipping prices simply add a pair to your Basket, then click the View Basket button. 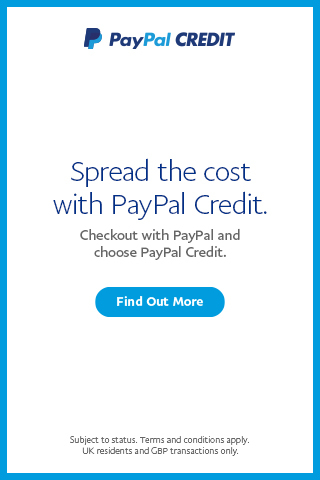 Our website will calculate shipping options for you and display the prices and estimated shipping times. If you've got any more questions, feel free to ask! If you have the Hex Pro with the standard bars fitted, the Arcade risers have around 20mm or so of extra total rise. If you have the more recent Hex Team bike then that is fitted with the Arcad bars as standard. The White w/Black logo option has been discontinued for a long time now, sorry. We got some very limited residual stock of the Silver w/Black Logo bars in very recently, to compliment our on-going stock of Black w/White Logo bars, but once the Silver bars have sold we'll be back to just Black. Sorry we can't be more help! What is the distance from the end of the bar to the point where the bar starts curving downward into the rise? My current setup is a TMS bar at 720mm with Shimano Saint levers. To get the correct brake lever position, I have to clamp the levers inboard to the point where they are located at the beginning of the curve, which tilts the angle of the levers back toward the bar. Rather than switch brakes, I'd like to switch bars but I want to make sure there is enough distance between the curve and the end. Hi, We've just measured both bars. The TMS ones have approx 17cm of straight section, where as the the Arcade bars have approx 19cm of straight section to clamp levers, so that should do the trick! Thanks, Stan. 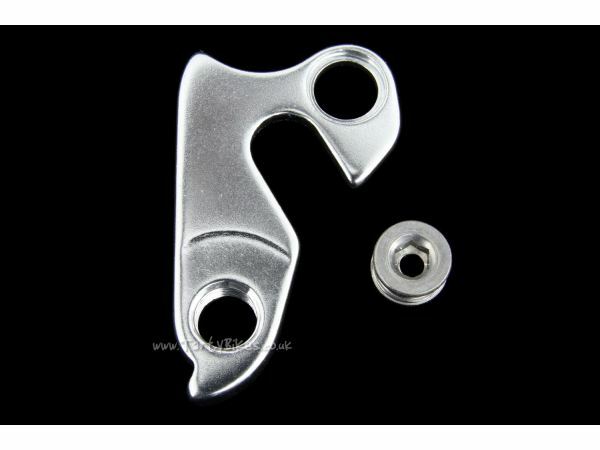 Hello, I was wondering if I could put these on a mountain bike. I have a 2012 Inspired element with a Trialtech stem, just wanted to make sure these bars will fit that stem before i go ahead and buy it. Decs. Hey I was just wondering if these bars will help me with manuals, and hops. Having a hard time getting leverage lately. Also will these fit my Inspired Element 2016 with the trial tech stem I got with the bike from tarty bikes? Thanks for your time haha, if you get this. 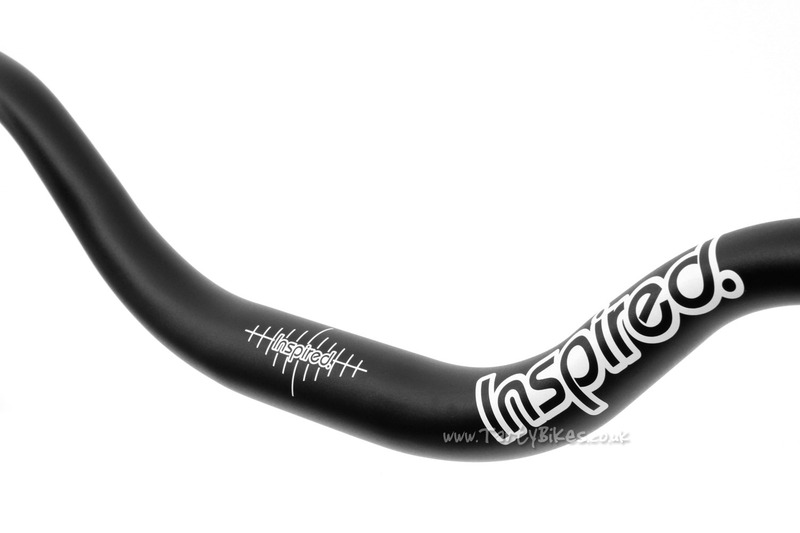 Hi, will these bars fit an inspired flow stem ? Hi Sergey - thanks for your question. Unfortunately they stopped making that style available separately, and they are now only found on the complete Arcade bikes. The closest alternative would be to get the black bars, remove the graphics, and put a black vinyl Inspired sticker where the logo should be. Hope that helps. Thanks, Flipp. Hi, will these bars fit an inspired fourplay pro stem ? Hi Fille - yes, these will fit in that stem no problem. Thanks, Flipp. Hi, I have the arcade bars on my Inspired and recently I noticed that they weren't centered in my stem, but the marks on the bars were centered. Could it really be that Inspired applied the marks wrongly? Hi Max - thanks for your question. It is not uncommon for graphics on handlebars to be slightly off. It is unfortunate, but there is relatively little to be done about it - even really big mountainbike companies have this issue sometimes! Thanks, Flipp. Hi Jason - thanks for your question. They should fit relatively easily, but unfortunately we cannot say for sure as we have never tried it. Thanks, Flipp. Hi Chris - thanks for your question. A large portion of what helps you ride is down to personal preference. 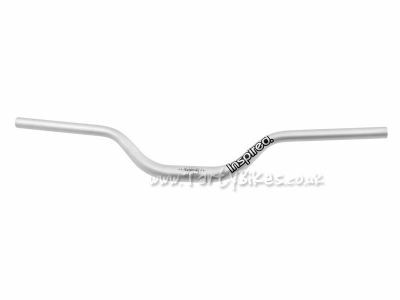 These bars have a lot of rise which is great for bumping up the front end height of your bike, though whether or not that's a good thing depends on how you like your bike to ride. If you feel a little cramped, then these bars might help to make you feel more at home by creating more space. They also feature a lot less sweep than more trials-oriented handlebars. Some people find this makes them a little nicer for streetier type riding, though several people run them on their 20" bikes for riding on rocks and very trialsy terrain. Sorry that's a bit vague, but hopefully it helped a little! Thanks, Flipp. These bars are simply amazing. They've changed my riding for the better and make moves like spins and manuals so much easier. Certainly the rider makes the biggest difference on any bike, but if there's one thing that helps quite a bit, it's these. I'm still fairly new to street trials, but these have been a great upgrade to my bike (coming from the truvative bars that came stock on my Inspired Arcade Fuse). On a side note, the customer service from Tarty Bikes continues to be amazing. 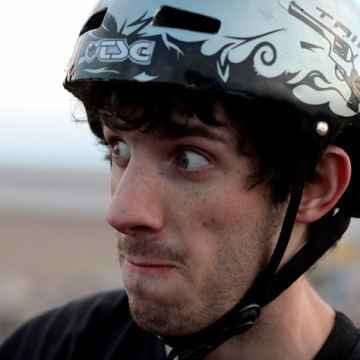 Being new to trials riding and not knowing exactly how these bars would effect my riding, I contacted Adam with my questions. As always, he was prompt and very detailed in his response, even going as far as reaching out to Mark for additional info that really helped me to decide on getting the bars. The bars arrived at my front door super quick and they were on my bike and being enjoyed right away. Two thumbs way up for Tarty Bikes and everyone that goes into making it a great resource for trials riders of all levels! Thanks guys!!! Hi Dave - Thanks for the detailed review, and for the nice comments. We really appreciate it, and we're glad you're enjoying riding your bike! I bought the Arcade Fuse which comes with Truvativ bars and I found that even though I'm not overly tall they felt a bit strange to me. I put it down to a bit of ring rust as I took quite a break from riding. I noticed especially when trying to do manuals that I just couldn't quite keep control as well as I thought - finding the balance point was really hit or miss. I started to wonder if a higher rise bar would feel a bit better so I tried them out. I felt a noticeable difference from the first time I pulled up on the test ride in the car park. Everything just feels right now. The bike handles the way I imagined it would when I first bought it. Some things are just worth the money and these bars complement the Arcade perfectly. Hi Anthony - I'm glad you like your new bars, and that they've given your bike the feel you were looking for. Thanks for the detailed review! As I was happy before with the deliverance of tartybikes, the steer arrived here in Belgium after 3 days! 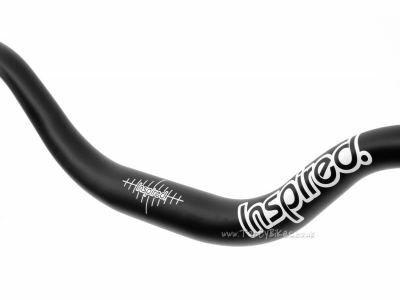 Was very happy, immeadiadly changed with my trialtech handlebar on my Inspired Fourplay Pro 24". Took it for a ride today and the result made me very happy, I did feel the difference very well, more control, more easier balance, manuals went way easier, more space for my knees since I'm pretty tall! I am not regretting this purchase, Thank you tartybikes! Hi Arno - It's great to hear you like your new Arcade bars. They're very popular for the reasons you've listed! I hope you continue to enjoy them, and thank you for the review. These bars give longer moment arm over front end and increase lift. Also, they straighten my posture when up on rear wheel making balance point easier to find and maintain. Great addition to my Inspired Element. Service at Tarty Bikes is first class. Great technical advice. Ordered parts one day and had them in hand 2 days later. Despite import tariff, shipping, still cheaper than buying similar products stateside. Although if my local bike store had the parts, I would buy locally to encourage the sport in the US. Hi Charles - I'm glad the bars have worked out well for you, and that's your happy with the service. Thanks for the review! 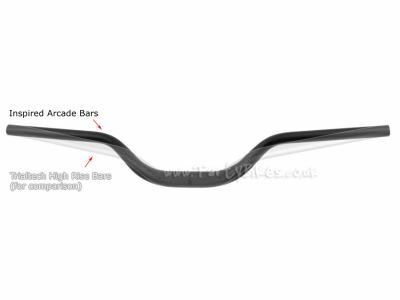 The arcade riser handlebars are very lightweight and I found that the shape makes it easier for me to perform a variety of tricks and also helps me find my balance point quickly. Lots of fun, highly recommended product! Now available in shiny Chrome Red finish!